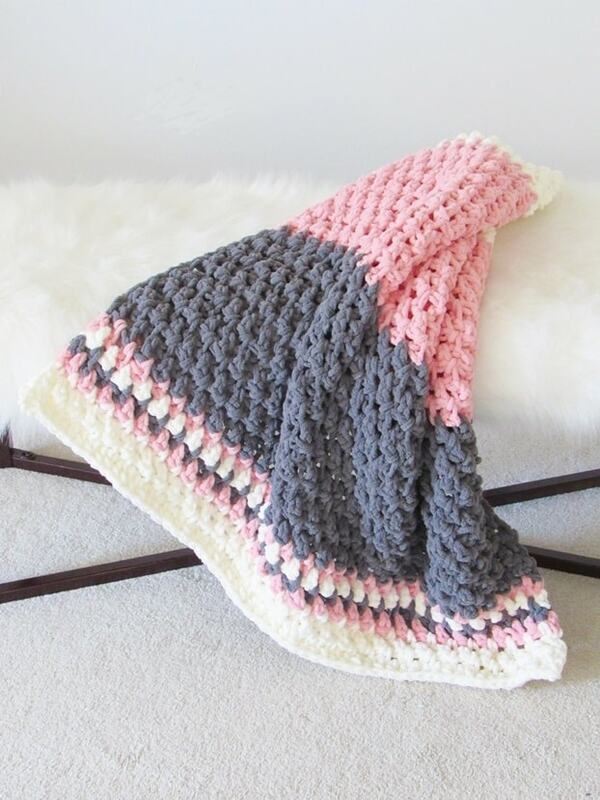 Who wouldn’t love making a free crochet baby blanket pattern that works up super fast and is super squishy to boot? I absolutely love quick projects, do you? Using a thick yarn and a quick stitch, you will be able to work this beauty up in under 5 hours. And no, this isn’t your regular Moss stitch. See that texture? I used extended single crochet stitches for this blanket and loved it. For someone who thought crocheting a baby blanket was boring, I cannot believe I am on my sixth blanket already. I am quite enjoying the ride. 2019 is going to be the year of Afghans on my blog :). Of course, you will see other patterns too. You can work from the written pattern below or purchase an inexpensive PDF for $2.50. Add to Cart here. The pattern will be emailed to you in a few hours. The PDF includes a stitch diagram for visual learners. Super Bulky, Size 6 Chenille yarn. Bernat Blanket yarn in colors Dark Grey, Vintage White and Bernat Baby Blanket in color Shell Pink was used for the sample blanket. Size K(6.5 mm) hook to weave in the ends. 32 X 39 inches when laid flat. 1 skein each of the 3 colors. Each skein had 220 yards. I used almost all of the cream color and 170 yards of the grey and pink. With the cream color yarn, Ch 60. You can ch any even number to increase the width of your blanket. Note: At the end of Row 3, I found that working your last st into the beginning ch 1 gave a straighter edge compared to working into beg ch-2. Note: You will alternate between Rows 3 and 4 with color changes in between. Row 5: Repeat Row 3 in color pink, join color grey at the end of the row, and fasten off the pink. Turn. Row 6: Repeat Row 4 in color grey, join color cream at the end of the row and fasten off the grey. Turn. Row 7: Repeat Row 3 in color cream, join color pink at the end of the row, and fasten off the cream. Turn. Row 8: Repeat Row 4 in color pink, join color cream at the end of the row, and fasten off the pink. Turn. Row 9- 23: Repeat Rows 3 and 4 alternately in color cream, join color pink at the end of Row 23, and fasten off the color cream. Turn. 1. 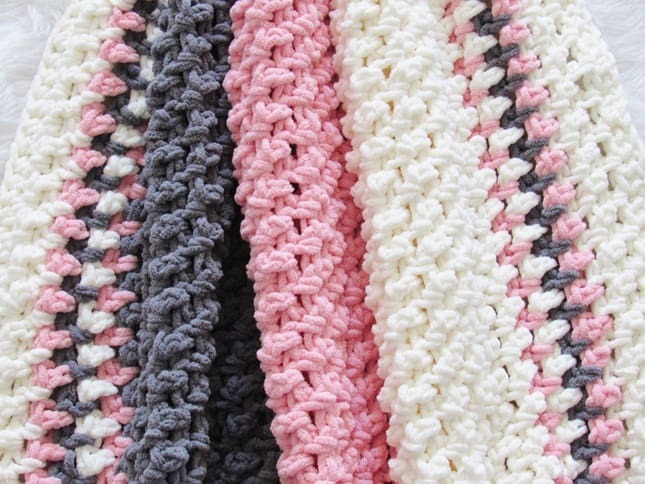 If you want to adjust the length of your blanket, you can crochet more or fewer rows here, but remember to write the number of rows down for the remaining two panels. 2. My cream panel now measured approximately 9 1/2 inches from the top of the pink row. Row 24-38: Repeat Rows 4 and 3 in color pink for the next 15 rows, join color grey at the end of Row 38, fasten off the color pink. Turn. Row 39-53: Repeat Rows 3 and 4 in color grey for the next 15 rows, join color pink at the end of Row 53, fasten off the color grey. Turn. Row 54: Repeat Row 4 in color pink, join color cream at the end of the row and fasten off the color pink. Turn. Row 55: Repeat Row 3 in color cream, join grey at the end of the row and fasten off the color cream. Turn. Row 56: Repeat Row 4 in color grey, join pink at the end of the row and fasten off the color grey. Turn. 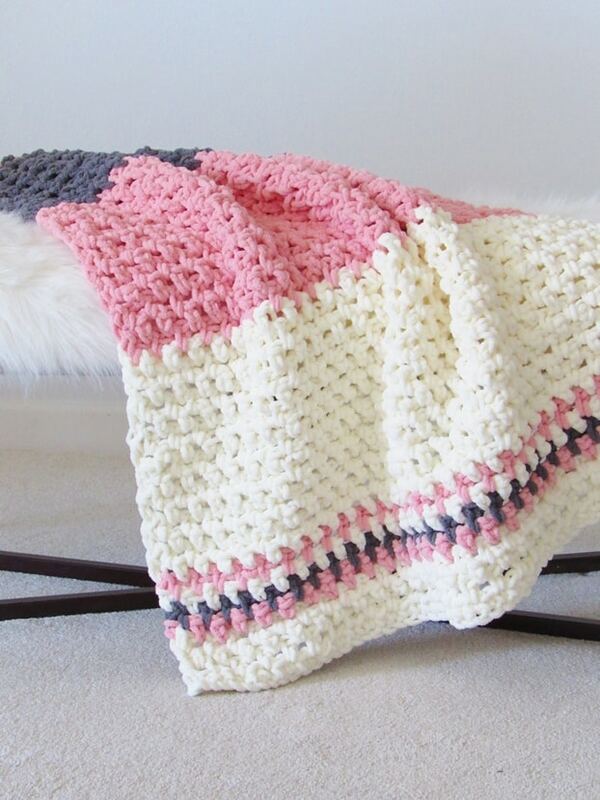 R0w 57: Repeat Row 3 in color pink, join cream at the end of the row and fasten off the pink. Turn. Note: The last Row is a hdc row and not a single crochet row like the first row because the hdc made it the same width as the first colorful panel. Using the smaller hook, weave in all the tails left. Take care to weave in through the top part of your esc sts to avoid your tails showing through the gaps. If you love making blankets, you might also like my 3 Hour Crochet Afghan and my Textured Crochet Afghan. 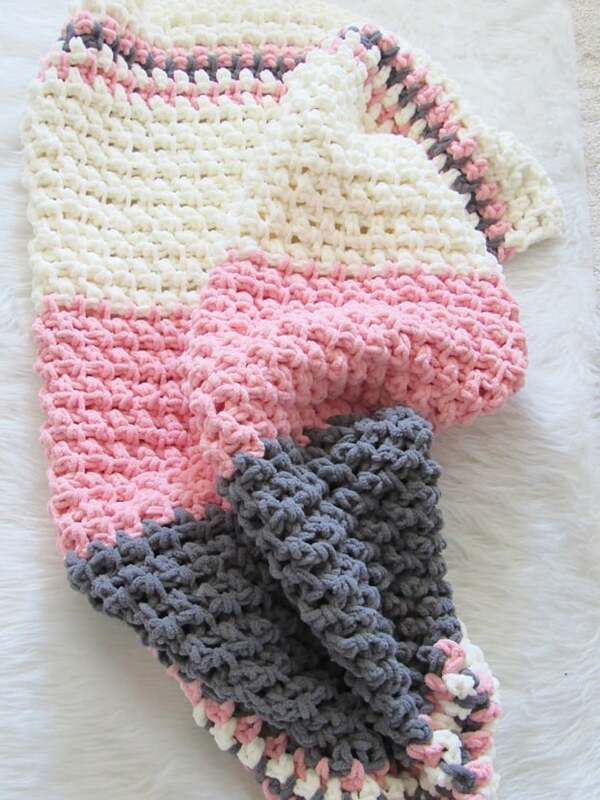 This 5 Hour Baby Blanket pattern was featured on AllFreeCrochetAfghans.com. Hi Anne, It is already mentioned at the beginning of the pattern. You can chain any even number. I just finished this blanket with blue instead of pink. So pretty. ThNks for sharing the pattern. Hi Joyce, I am so glad to hear that. I wish I could see your blanket. I just made this with pink, cream, and yellow for my cousin’s little girl. Very cute! Thanks from sharing! Hi Jamie, I am so happy to hear you love how it turned out. Thank you for commenting. I love hearing from my readers. I’m feeling frustrated, on row two followed exactly and still have a spare stitch at the end! At the beginning of the row do I skip two stitches? At the beginning of Row 2, you skip the very first st and the next one. Hope that helps. Is there a pattern I could get I do better with written instructions. I also want instructions for 3 hr. Afghan. What do I do to get these? There are links to purchase the PDF included in the blog posts. Scroll a little beyond the blanket pictures at the top and you will find the link in red. This blanket is lovely. 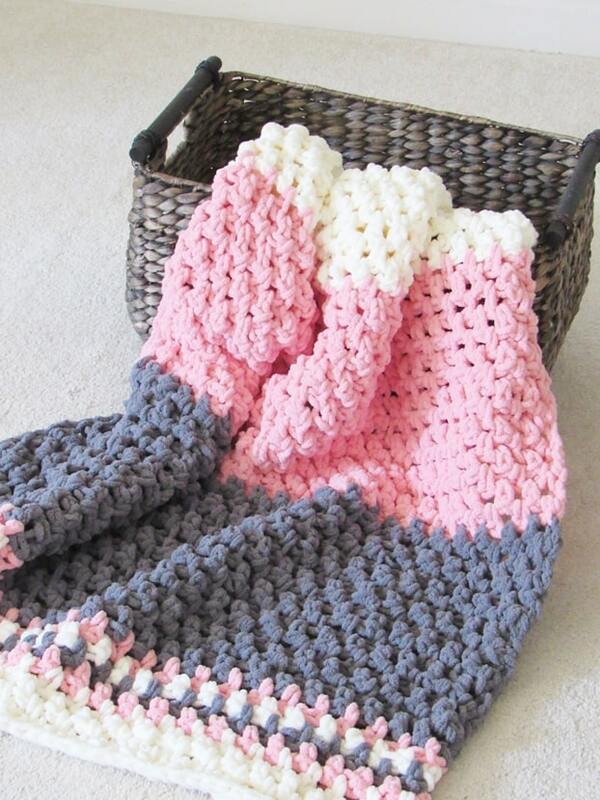 I’ve already made your 3 hour blanket for a new baby boy! Can’t wait to give it to him. 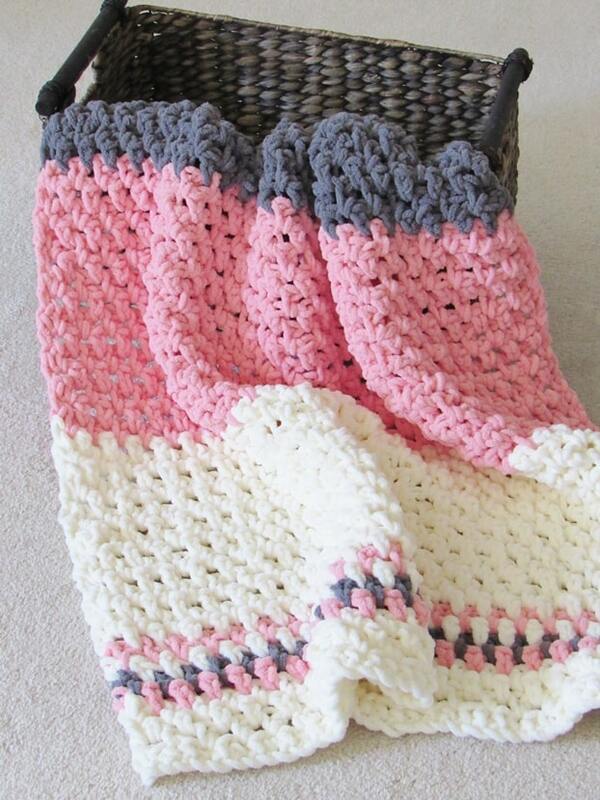 One quick question…instead of using #6 bulky yarn, I’m thinking of trying this by using two or perhaps. Three strangers of yarn held together. What do you think? Hi Chris, I am so glad to hear that. Yes, absolutely, you can try working with three strands of lighter weight yarn. I’m sort of new at crocheting after making many blankets for family and friends with plain stitching. 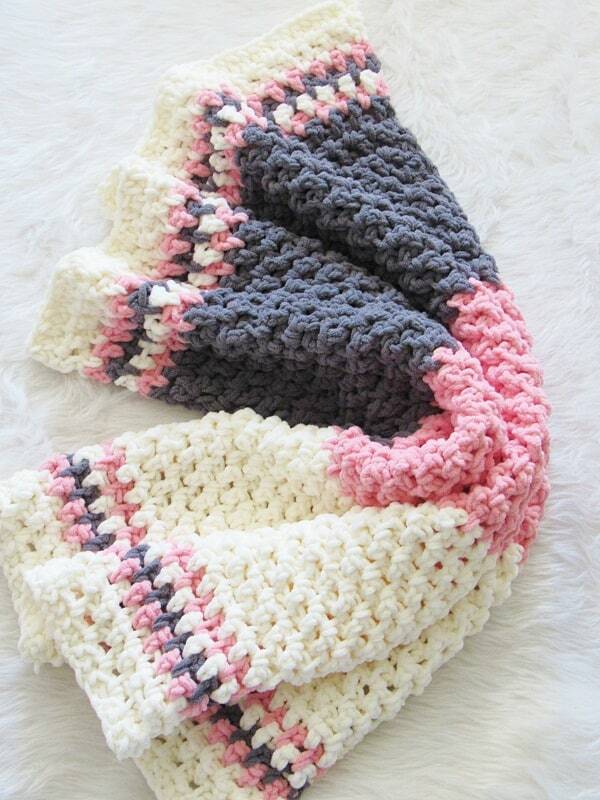 I’ve fallen in love with this pattern and have all the yarn, but can’t figure out the different colors in the edging. My friend has a new granddaughter who is in U.K. And she is leaving April 2nd. Help. I want her to take this blanket with her. Hi Christine, try following the pattern and let me know which part you find hard.